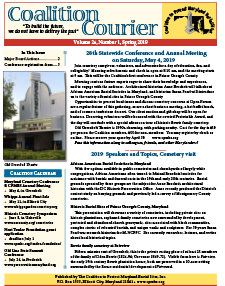 The Coalition publishes a quarterly newsletter called the Coalition Courier. The newsletter reports on current events and issues involving Maryland cemeteries; provides updates involving the Coalition including minutes of Board meetings, outreach endeavors, and results of elections; and informs the members of upcoming cemetery-related activities. All members are invited and encouraged to share their cemetery stories, successes, ideas, and concerns. Any articles or information you wish to have printed in the Courier must be submitted electronically to Editors.